Helping kids make healthy food choices doesn’t have to be difficult. In fact, the National Heart, Lung, and Blood Institute created a simple way for kids to eat smarter: Just apply these categories: Go, Slow, or Whoa. The goal is to eat a lot of Go foods, some Slow foods, and just a few Whoa foods over the course of the week. 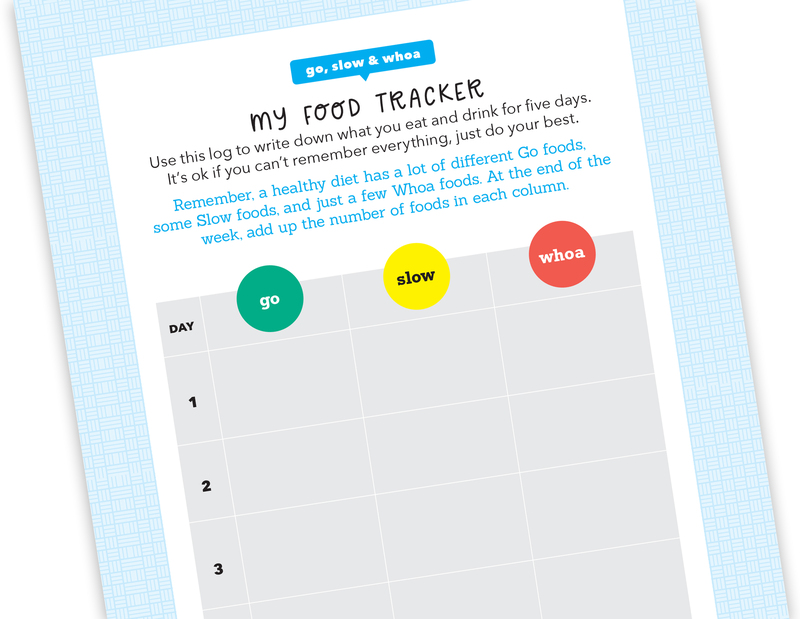 Use the guide below to get started, then download and print our five-day food tracker so kids can see how their choices stack up. If they notice that their Slow and Whoa categories are bit on the long side, have them take up up the challenge again and see if they can do better the next week. It’s all about making small, incremental changes so don’t worry if you don’t see those Whoa foods totally eliminated. That’s not the point anyway. Treats are perfectly fine once in a while…that’s what makes them treats! Here’s to healthier eating for the whole family! WHOA: Stop and think before you eat! Whoa foods are very high in sugar, fat, and/or calories, and often don’t have many vitamins. Consider them once-in-a-while treats. SLOW: Foods you can eat sometimes—like two or three times a week. They tend to be higher in sugar, fat, and/or calories than those in the Go category. GO: Foods you can eat anytime! They’re low in sugar, fat and/or calories, and they usually have lots of vitamins and minerals. Try to eat as many different Go foods as you can! Have even more healthy-eating fun and play Superfood Bingo at the grocery store! Your kids will see just how many yummy Go foods there are! Next post: Take the “Shake My Booty” Pledge!